Attention, wedding belles and gorgeous guests — you’re cordially invited to explore ModCloth’s exquisite weddingcollection! Fall in love with dreamy dresses and outfit finishers perfect for brides, bridesmaids, and attendees eager to express their unique perspective on style. And don’t forget — we want to see the fab ModCloth look you put together! Be sure to use #marriedinmodcloth to share your inspiring ensemble with the rest of the ModCloth community. I love these 3 dresses and I will be more than happy to tell you why. We had a simple, small wedding; don’t get me wrong, it was beautiful, but not what I had dreamed of while growing up. I think that with these 3 dress choices, I could have dressed myself, as well as my maid-of-honor and my bridesmaids and we would have all looked fabulous. I love the simpleness of the wedding gown. It has an elegant beauty that screams wear me! The soiree dress, is also simple but very lovely, so not to take away from the brides big day. The pink dress I just think is gorgeous, and flowy- which is kind of a big deal for me. Along side of their fabulous dresses, they have gifts, home decor, and so much more! 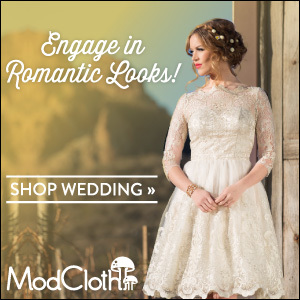 Be sure to check out their Wedding Style collection, or view their other great items at ModCloth.